My Top 5 Red Lipsticks | Beauty Essentials. Yves Rocher Moisturising Cream Lipstick//Shade ‘101 Framboise’. Bourjois Rouge Edition Lipstick//Shade 10. L’Oreal Paris Color Riche Exclusive Reds//Shade ‘Blake’. Rimmel Apocalips Lip Lacquer//Shade ‘Big Bang’. I am a complete red lip lover. If you had asked me a couple of years ago what my favourite colour lipstick was, i’d have told you I didn’t wear any. I always thought that if I wore lipstick, especially in a bold colour, it would make me stand out and I hated the thought of that. Now, i’m a complete convert. My most worn lipsticks are either reds or dark berries, probably the boldest colours you can go for..except neon green or purple but i’m not that adventurous. My number one rule for wearing red lips is to always apply a lip liner! This helps the lipstick last longer and stop the colour bleeding into fine lines. I use the Mac Lip Pencil in Brick and it goes amazing with all the red lipsticks I own. I have done a full post on my love for lip liners here. As you can see from the list the majority of my red lip picks are from the drugstore, and under £10! You don’t need to spend a small fortune to get the perfect red. There is so much choice in Boots or Superdrug, whether you like lipsticks, glosses or lacquers there is a formula for everyone. 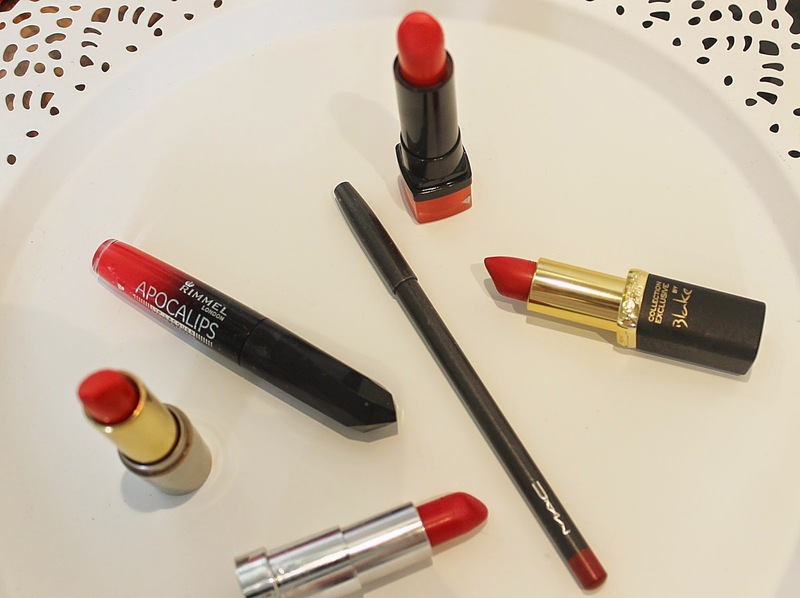 What is your favourite red lip product? Tags: Beauty Essentials., Lip Lacquers., Lipstick., Top 5. Previous PostThe Body Shop Haul. Next PostTop 5 Reads This Summer. What a lovely selection of red lippies. I really like the Apocalips & need to get myself Big Bang. I have fallen in love with a red lip too but I haven't found my right shade but these look like lovely choices. I too have fallen in love for a red lip! I love Russian Red and Kate Moss 107 but I really want Blakes red! I use the brick liner from Mac too haha!